Our full camp set-up includes our a-frame/lean-to wigwam (with a 12x 24’ footprint), our shade shelter (about 11x11’ footprint), and our hearth rig (about 12’ long). 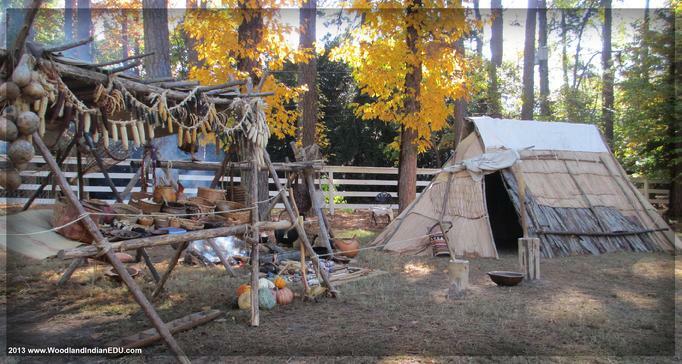 Our camp set-up at Stone Mountain Powwow in Georgia, 2013. Our a-frame (with small doorway) or lean-to (with large side open) is built of dozens of saplings (mostly cedar) and covered mostly with mats (cattail and those that mimic native reed mats). Often we also add some bark sheets (usually poplar or hickory) and utilize a period canvas for the rid covering (and fly in needed). 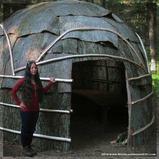 The a-frame (or double conical) is well known for it’s use in the northern forests (such as among Ojibwe and Ottawa Peoples, seen at sugar and rice camps among other places), however, the basic shape is more generally used among many Woodland Peoples as camp shelters (that is a-frame with two long, flat sides). 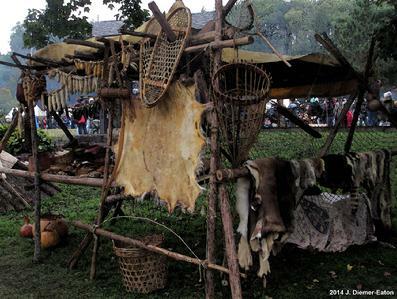 And indeed lean-to structures (in it’s different variations) were found throughout the woodlands, utilized especially in hunting and fishing camps. For this reason, and the fact we can transport it life-size (12x24’ foot print, with a 7-8’ peak), we have chosen it as our camp shelter for our programs. 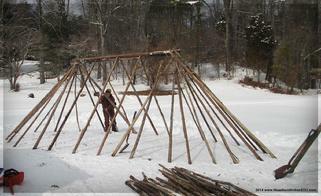 Building the a-frame on site at LM Sugarbush, IN, 2014. Mats are layered to cover a-frame on one side. Our a-frame/lean-to wigwam on the Ohio River at Falls of the Ohio State Park, 2014. Our a-frame wigwam at Mississinewa 1812, IN, 2008. 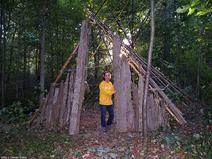 Students explore our a-frame/lean-to at Oakville Indian Mounds Museum in Alabama, 2014. 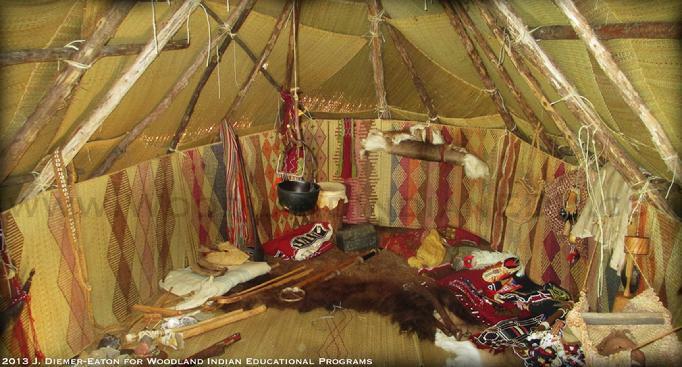 A-frame wigwam interior at the Eiteljorg Museum's Indian Market 2013. Our shade shelter utilizes four tripods to raise it’s roof, so that we can erect it safely without putting holes in the ground. Shade shelters were utilized as outdoor workspaces (often for preparing foods). 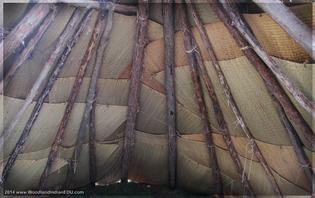 They were covered with bark sheets, mats, or piles of brush, and later after European contact, with canvas. Ours uses mats (seen on the underside) and is covered on top with a canvas. Native foods displayed under our shade shelter, Georgia, 2013. Shade shelter at Feast of the Hunters' Moon, IN, 2014. 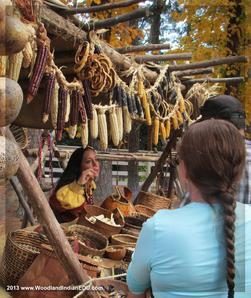 Native foods display at Prophetstown State Park, IN, 2013. 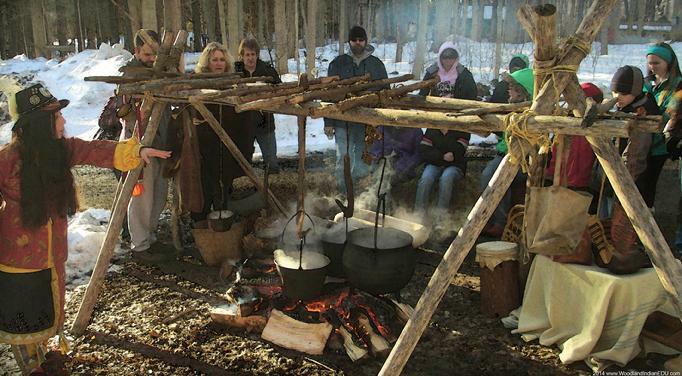 Our fire set-up is fashioned after Ojibwe maple sugaring hearths (it would, however, be shortsighted to believe the Ojibwe were the only people utilizing such a frame given the wide-spread use of hearth frames). The horizontal double runner “ladder-like” form allows the cook to move heavy pots to and from the fire at a moment’s notice easily and safely. Rarely, we will use only one runner pole across instead of two to hang the pots from. Most of our iron, brass, and copper kettles are hung by branches made into hooks (our largest iron pot is hung by iron hooks). Our hearth set-up at Bendix Woods Sugar Camp Days, IN, 2014. 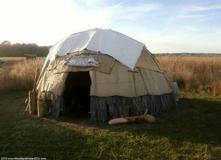 At some events we are invited to use the structures on site. If you don't have such home exhibits and would like them, keep in mind we conduct workshops building these structures for museums and historical sites. If you are interested in a permanent dome wigwam, bark cabin, a-frame, shade shelter, or any related Native village structure, please reference our dome wigwam construction workshop.